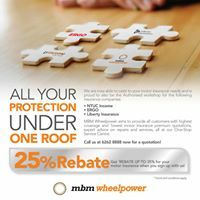 Get up to 25% rebate when you sign up for NTUC Income, Ergo or Liberty Insurance at MBM Wheelpower. If you are paying $1,000 for your premium, you will get receive $250 MBM Vouchers to spend on any of our products or services. Terms and conditions apply.